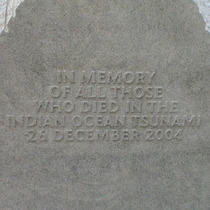 In memory of all those who died in the Indian Ocean tsunami, 29 December 2004. 120-tonne block of granite, 4.1 metre cube with a corner removed. According to Handy Shipping Guide this was the "biggest transportation of a single piece of stone in the UK or France since the building of Stonehenge and the tale of how the giant piece came to arrive at the Natural History Museums gardens is worth telling." The prime organiser of this memorial, Michael Holland, lost his mother, wife and daughter in the disaster. The tsunami, this memorial and its unveiling are well covered at the Natural History Museum. The BBC provides some information about, and photographs of many of the dead. Not surprisingly with so many names, there are some discrepancies between the BBC list and that on the memorial. Where possible these are addressed on the individual subject pages. But also there are 12 names on the memorial that the BBC does not have, and 5 that the BBC has but do not appear on the memorial. The BBC list is dated December 2005 so possibly the memorial list, being later, is more accurate. More than 230,000 people died, 153 being British.